We have worked to assemble a database of ultrasound technician training programs to choose from in your area. We have also compiled state specific education and work requirements. Finally, we have numerous guides and articles written on ultrasound technicians to provide further insight into this career choice and answer any questions you may have. Regardless of whether you are still only considering a career as an ultrasound technician, having decided that it is and are looking for a school nearby, or have completed the program and are looking for employment, we have all your bases covered. Note regarding school listings. Our website feature schools that are our clients and from whom we may receive compensation (“Sponsored Schools”). Our websites are not intended to provide a comprehensive list of all schools in the United States or of all schools located in a specific geographic area or of all schools that offer a particular program of study. To find out further information on the process of becoming an ultrasound technician simply click on your state. We have provided information on every aspect from schools to work and certification requirements, average salaries, and more. 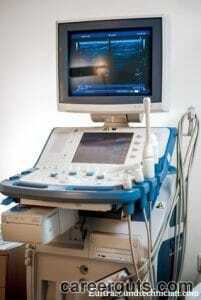 What is an Ultrasound Technician has been a question that many inquiring minds would like to know. An ultra sound technician is a professional that uses current technology to carry out the ultrasound examinations of patients who are pregnant, have cancer or other injuries or potential diseases that involves the internal organ. They are specially trained by local colleges that offer online or onsite training. Most techs work in the field of gynecological ultrasonography neuro-ultrasonography, abdominal ultrasonography, cardiac ultrasonography and breast cancer ultrasonography. With the use of specialized equipment, Ultrasound technicians sometimes called Sonographer, Ultra Sonographer and Diagnostic Medical Sonographer are able to take pictures of patient’s internal organs through a method called X-ray. These pictures help to identify potential problem areas so that physicians are able to treat them. Before getting started in the Ultrasound Tech field, individuals must receive the proper education and ultrasound technician training. There are various ways to become an Ultrasound Technician. One method would be to attend college and obtain a professional diploma or degree. By attending college you get hands on experience and the necessary book knowledge that will help you pass the examination required by the national registry should you seek certification. The average college completion rate depends on the level of study you are seeking. There are numerous associate or bachelor degree programs which can extend from one year to four years maximum. The hand on experience, which is usually during internship, is a requirement for the program. There are several ultrasound technician training centers across USA such as the AB Tech Community College at http://www.abtech.edu/, Kaplan College at http://kaplan.com, Associate-Neuro-diagnostic Technology (New Jersey) and also the Jefferson Ultrasound Research &Education Institute (JUREI) which are approved by the American Registry of Diagnostic Medical Sonographer (ARDMS). After training completion, technicians are certified and find jobs in hospitals, nursing homes, diagnostic laboratories and outpatient’s care centers around the world. Due to a high demand in the healthcare industry, facilities are looking to hire people right away. In this field, the work hours can be hectic, but worth it. The shifts usually are from 8, 10, or 12 hours depending on the facility you are working for. If traveling, you work schedule will vary and pay will either be hourly, salary or contract. Sometimes travel expenses are included so be sure to negotiate with your employer before making the decision to take on a mobile Ultrasound Tech position. Overall, the healthcare sector is expected to rise almost 150% in the next ten years. In the future, employment in this field will reach a record high above any other job throughout the job market history. Even now the absorption rate of the hospitals from the training centers is over 75%. As per the survey the job growth in this field has doubled and will possibly triple by the year 2015. This will lead to a great future with good pay and job security for Ultrasound Techs. Now is the time to get trained before it’s too late!